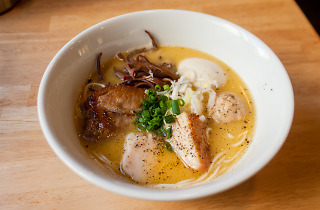 Hakata is of course best known for its tonkotsu, but the Fukuoka neighbourhood has also given birth to another noteworthy type of ramen: the Hakata mizutaki. Savour an additive-free version of this creamy chicken soup at Nerima's Ukanmuri, which serves up bowls that won't leave you feeling too weighed down afterwards. 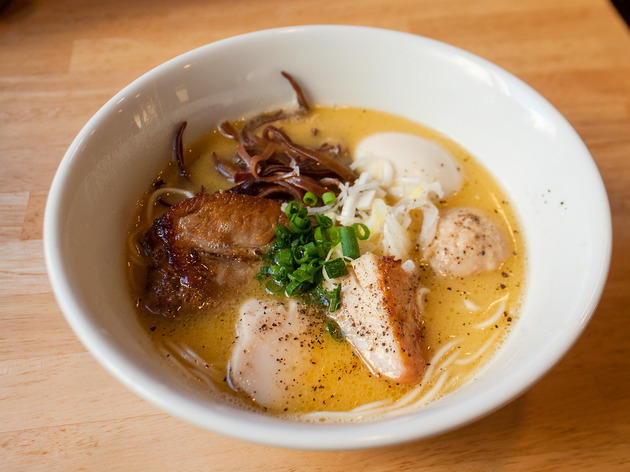 Except for the soup, all the components – thin noodles, kikurage mushroom and leek toppings, classic ajitama – are directly from the tonkotsu handbook. Chicken fans will appreciate the trifecta of bird meat toppings, namely yuzu-flavoured tsukune meatballs, aromatic loin and soft, moisture-packed breast, while those looking to go all out will want to order the Yokubari Set – this topping package gets you all of the above plus some superb roast pork to accompany the fowl.